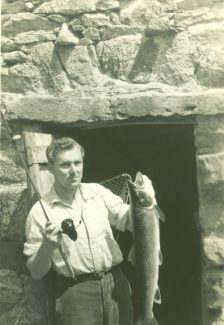 Hugh Falkus, 1917-1996, was one of the foremost natural history film-makers and angling writers of the twentieth century. Two of his BBC films, “Salmo the leaper” and “Self-portrait of a happy man” enticed many viewers to become salmon and sea-trout anglers. A third film, ” Signals for survival” made with Niko Tinbergen, Nobel Laureate and Professor of Animal Behaviour at Oxford, is still the only BBC programme ever to have won both the Montreux Film Festival Italia prize and the New York Blue Ribbon Award for documentaries. Three of his books, “Sea Trout fishing” (1962), Salmon fishing” (1984) and “Freshwater fishing” (With Fred Buller, 1975) are considered classics. Although he spent the last years of his life in Cumbria, his early and decidedly formative years were spent in and about Benfleet Creek. ” Ours was a remote and contained life . During much of my boyhood we lived afloat, first of all on the east coast in “Neptune”, a converted Thames barge. So dedicated was James his father to life afloat , that in the mid- 1920s the family decamped from their suburban existence and went to live on a houseboat full-time. 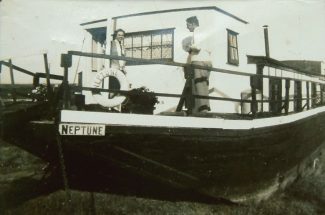 The “Neptune” was moored in a backwater of the creek that runs along the north side of Canvey Island. 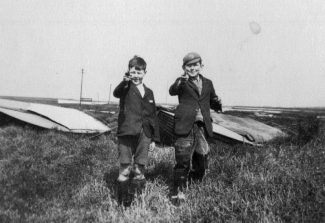 By the mid 1930s James Falkus had retired from the bank to spend every available minute on his beloved Essex marshes, sailing, fishing and shooting. Hugh was an apt student and from an early age could shoot, fish and sail. A companion on many of their expeditions was a one-eyed wildfowler by the name of Puggy Dimmond, an ex-sailing barge skipper, who lived on “Seawitch”, another houseboat. Often these turned out to be misadventures – stuck on the mud with the tide ebbing or the engine packs up. On one occasion his father does a “Basil Fawlty” and verbally castigates the magneto when it lets him down. On another occasion they set off for Holland and they run aground in the fog. Worried that they will be run down by larger vessels, they take it in turns to bash a saucepan in lieu of a fog horn. As dawn breaks they hear a strange noise coming towards them, which does not waver despite their improvised alarm system, only to find as the fog clears that the noise emanates from a horse and cart being driven along the edge of Foulness! These stories, Hugh relates with a great deal of humour in his book “Stolen Years” Another story involves Puggy and a Mr Herrington, the Inspector of Rates for the local council. In those days if the houseboat could float off , they were exempt from rates. If they couldn’t, they were required to pay. Puggy’s boat was stuck fast and would never float off. However with the help of empty kegs and barrels lashed to the side for extra buoyancy and a liberal offering of rum from a stone jar, Puggy and Falkus major and minor, plus several other helpers managed to convince Mr Herrington that the boat moved and was therefore exempt. “The Stolen Years” published by H.F.and G. Witherby in 1979. My thanks to Chris Newton for so readily allowing me to quote text and use photographs from his biography of Hugh. I was named after his father, James. Nice to see that he is still remembered. 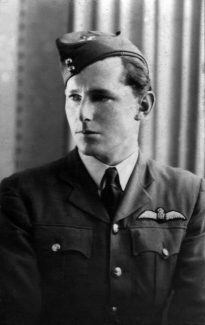 A very complex person my father described him as.